La Grande Plage in Biarritz is desolate but still dreamy in wintertime. Most visitors come to Biarritz during the summertime for a classic seaside vacation. In the high season, the beaches become checkerboards of tightly packed sunbathers in orderly rows of lounge chairs with colorful parasols. The sound of the waves is obscured by the noises of people chattering. However in winter, this oceanfrotn Basque resort in Southwest France is a haven of peacefulness and exclusivity. Prized for its expansive sandy shores, Biarritz was a favorite destination of Empress Eugénie, the wife of Napoleon III. She convinced her Emperor hubby to build a seaside retreat at this stunning spot on the Bay of Biscay, and he complied with a glorious palace designed in lavish Second Empire style. Ever since, Biarritz has been a fashionable beach resort known for its refined restaurants and upscale boutiques. Napoleon and Eugénie's palace has been converted to the Hôtel du Palais, a prestigious 5-star hotel with luxurious accommodations, two gourmet restaurants and private beaches. The former grand salon is now the Michelin-starred Villa Eugénie Restaurant. In this elegant dining room of inspiring high ceilings and dazzling crystal chandeliers, guests indulge in the finest Basque cuisine while admiring the ocean views. Standards of excellence are seen in every detail, from the floral decor to the superb service. I was lucky enough to have lunch at the Hôtel du Palais' Villa Eugénie Restaurant. For the main course, I chose the Red Snapper Seasoned with Piment d'Espelette (a mildly spicy pepper that grows around the village of Espelette of the Basque region). The fish was served over Risotto with Calamari in a Squid Ink Sauce. The desserts were truly the highlight of the meal. The Vanilla Cake with Lemon Sorbet and Raspberries was artistically presented and exquisitely flavored. The best dessert was surprisingly simple: Baked Pear over Puffed Pastry with Caramel Ice Cream. I'd like to attempt this at home! The most original dessert was the profiteroles. Presented on a plate reminiscent of a painter's canvas, the Vanilla Ice Cream with Roasted Cherry Profiteroles were topped with a decadent chocolate sauce. Adorable little after-dinner desserts provided the finishing touch. The platter included chocolate truffles, mini pound cakes glazed with lemon icing, pistachio-cream mini tarts, butter cookies and handmade nougat candies. After the Hôtel du Palais, the next essential gastronomic stop in Biarritz is the Miremont Pâtisserie. Founded in 1872, this dainty boutique has catered to high society ever since it opened. King Edward VII of England was a loyal patron and King Edward VII of Spain had lunch here on occasion. The Miremont offers a selection of traditional French pâtisserie, such as charlottes and mille-feuilles, along with handmade candies and chocolate truffles. Of course the selection includes traditional Gâteau Basque, a double-layered tart filled with almond pastry cream and sometimes fruit. You may take the pastries to go or savor them while seated down in the dining room, which offers lunch options as well. Decorated in refined 17th-century style, Miremont dining room gives the impression of being in Paris but with gorgeous ocean views. The room overlooks the Grande Plage (Grand Beach), the most popular beach in Biarrtiz. While in Biarritz, be sure to see the most famous sight: the Rocher de la Vierge (Virgin on the Rock). During winter, the Atlantic waves are wild and dramatic, exciting for surfers, and all the more exciting for traversing the bridge to see the Virgin on the Rock! Like all coastal towns, Biarritz has a classic lighthouse. I had someone snap a photo of me in front of that monument with my tour guide Veronique from Détours Pyrénéens. She was absolutely fantastic! I highly recommend this company for customized tours and excursions around the Basque Country. Following our visit to Biarritz, we traveled further south along the coastline to Hendaye. Here the scenery is simply breathtaking. The sheer cliffs drop off dramatically into the sea. This site is not for the faint of heart. I loved the scenery but it gave me vertigo! Next we took a scenic drive through the countryside along the way to Saint-Jean de Luz. Opposite the coast are peaceful estuaries and typical Basque red-tile roofed houses. Saint-Jean de Luz is another town with a regal past. In 1660, King Louis XIV married to Marie-Thérèse of Austria in the town's Church of Saint John the Baptist. The entire city is filled with quaint half-timbered houses and historic buildings. All over Saint-Jean de Luz are charming buildings with red shutters typical of the Basque region. During summertime, residents close the shutters during the day to keep their rooms cool or perhaps to take a nap! Maison Adam is a must-stop shop for anyone who loves chocolates and macarons. In fact, this shop invented the macaron in the 17th century. They claim to have France's most authentic macaron. France's original macaron was a simple flour-less almond cookie. Maison Adam macarons are perfectly moist and not too sweet. 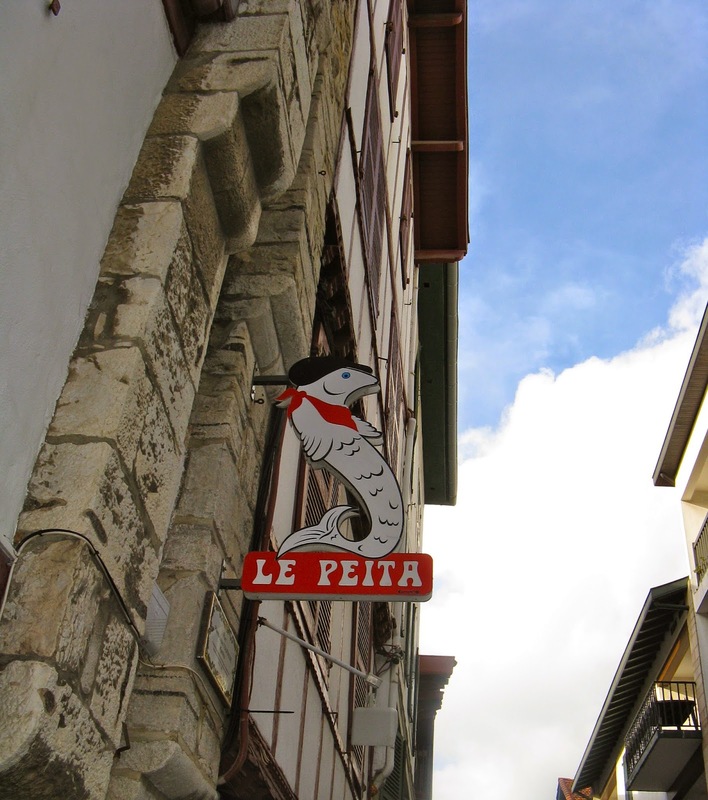 Saint-Jean de Luz is also a gastronomic capital, with gourmet shops galore! Take a peak in the culinary boutiques. You'll find products to bring home or for picnic. 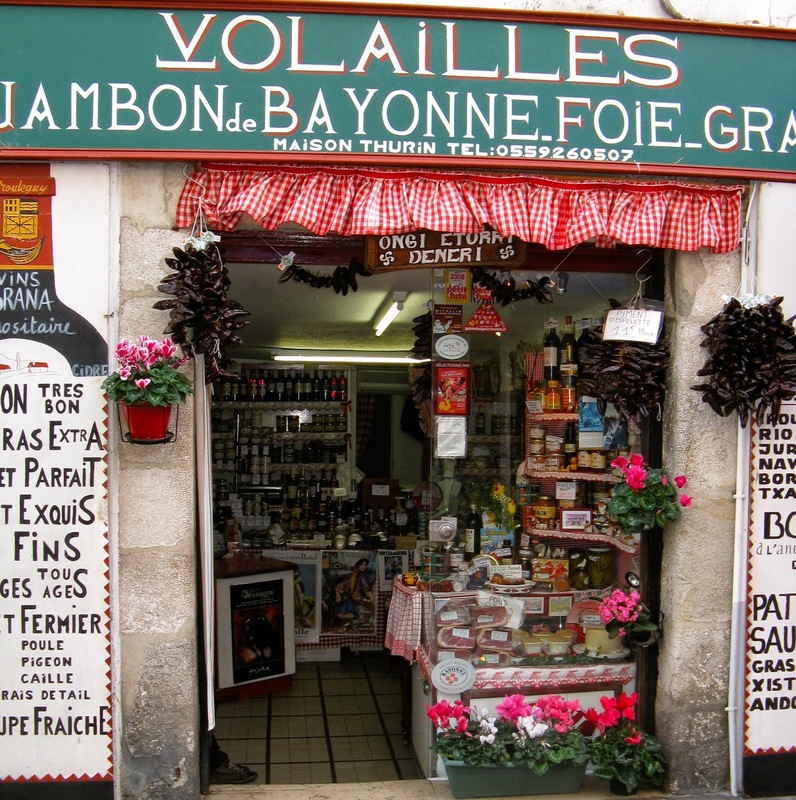 Specialties include Jambon de Bayonne, a distinctive type of ham from this region, and Foie Gras. Gâteau Basque is even more ubiquitous in Saint-Jean de Luz than in Biarritz. You'll see this dessert in almost all the bakeries in town. In every corner, the Basque Country shows off its style. Even the fish wear Basque-style berets and scarves in this proud region. Saint-Jean de Luz is full of ambience. Take time to soak up the atmosphere and blend in with the locals as they chit chat with friends and family. The entire city seems to be an open-air social gathering.